This post is show-only for the Friends of English Magic who have yet to read the various books about magic, books of magic, periodicals discussing magic, and the latest fashion in the capital, Miss Clarke's novel of magic. I'm finding this series fascinating, partly for the bravery of the producers retaining the sense of the Georgian era, such as language, dress, housing and culture. And now we get some real magik, with Strange demostrating he's prepared to take hold of the earth and let the horses run. Comments on IMDB convey bewilderment and boredom, but there is so much to it, and it requires a fine focus and patient temperament. Jonathan Strange changed from a rambunctious, ungrounded young man into a star apprentice (albeit one who is excited about a possibility his mentor doesn't support) with surprising speed and a general lack of rebellion, as I would expect from the character we saw in the first episode. I liked seeing more of the (fairy?) realm of The Gentleman, though the women with binding over their mouths was worrisome (I realize this isn't a fun place, but I still hoped there wouldn't be a focus on controlling women or whatnot). 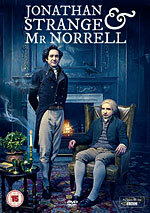 What does Mr. Norrell know of The Gentleman? It seems like he was quick enough to call upon him to bring high regard to True English Magic, but then gives up on the "madness" of poor Mrs. Pole. Then again, this episode seemed to be about how quickly his magical prowess was overshadowed by Mr. Strange, who wasn't even winded by his summoning/creating of the Horse Sand horses. Compare that to the talking stone people in the previous episode, which wiped out Mr. Norrell. Bigger effect, definitely, but Jonathan went bounding off for snacks after saving the day. They just had this episode on BBC America last night. I was reserving judgment after the pilot, but I'm definitely enjoying it now. I'm finding this series fascinating, partly for the bravery of the producers retaining the sense of the Georgian era, such as language, dress, housing and culture.